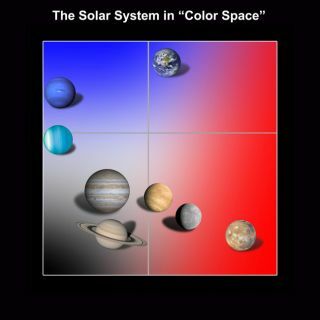 NASA researchers analyzed the light reflected by the planets and plotted the results on a "color-color" diagram. By plotting the ratios of red to green light as well as blue to green, the planets cluster into "color families." On this diagram, Earth is easily distinguishable from the other major planets. Astronomers hunting for Earth-like alien worlds could improve their odds by zeroing in on planets that look blue from afar, just like Earth, a new study suggests. Researchers have devised a simple way to distinguish between the planets of our solar system based on color information alone. Earth in particular stands out clearly among the other planets from space, researchers said, appearing much bluer than Mars, Venus, Mercury and the gas giants. The finding could aid the search for life beyond Earth, helping astronomers focus their attentions on the worlds most likely to harbor life, researchers said. "Eventually, as telescopes get bigger, there will be the light-gathering power to look at the colors of planets around other stars," said study leader Lucy McFadden of NASA's Goddard Space Flight Center in Greenbelt, Md. "Their colors will tell us which ones to study in more detail." McFadden and her colleagues used new color information about Earth, the moon and Mars gathered by NASA's Deep Impact spacecraft as it zoomed through space en route to a close encounter with Comet Hartley 2 on Nov. 4. Deep Impact's instruments eyed these celestial bodies through a variety of filters, sampling light at different portions of the spectrum. The relative amounts of light passing through varied significantly, providing a kind of color fingerprint. The team added to Deep Impact's observations existing color information about Mercury, Venus, Jupiter, Saturn, Uranus, Neptune and Saturn's largest moon, Titan. The team found that color data from three different filters — one in green light, one in red and one in blue — separated the planets out from each other very effectively. The researchers drew up a chart that clustered planets into groups based on similarities in the wavelengths of sunlight that their surfaces and atmospheres reflect. The gas giants Jupiter and Saturn huddled in one corner, Uranus and Neptune in a different one. The rocky inner planets Mars, Venus and Mercury clustered off in their own corner of color space. But Earth did not cluster with any other planets, standing by itself in one part of the chart. Its uniqueness traces to two factors, researchers said: the scattering of blue light by its atmosphere and the fact that it does not absorb much infrared light. Earth's air is low in infrared-absorbing gases like methane and ammonia, compared to the gas giant planets Jupiter and Saturn, according to researchers. "It is Earth's atmosphere that dominates the colors of Earth," said co-author Carolyn Crow, a grad student at UCLA. "It's the scattering of light in the ultraviolet and the absence of absorption in the infrared." The team's study will be published in an upcoming issue of the Astrophysical Journal. Planets around other stars probably exhibit a rainbow of colors every bit as diverse as those in our solar system. Astronomers could eventually apply the new study's findings, using the three-filter approach to get a rough idea of what an exoplanet's surface and atmosphere might look like. For example, if an alien planet shows a similar color fingerprint to Earth's, it would not necessarily mean that the planet has the blue skies and vast oceans of our home. But it could tell astronomers to look at that planet more closely. And that would be an important first step toward making sense of the colorful complexity of the 490-odd alien planets already discovered, and the scores more on the way, researchers said. Astronomers have already directly imaged a handful of alien planets around distant stars, and this number should only increase as technology advances and scientists hone their techniques.